PR: When did you start modeling?CHARLOTTE: Approx 1.5 year ago I was scouted on internet but as I still go to school I only do jobs every now and then. I started with a few tests and after that was lucky to shoot an editorial for Celebrity magazine. PR: What are your first impressions of modeling...CHARLOTTE: I really, really enjoy modeling. I think it’s great to work every now and then with adults, inspiring professionals who are all good at what they do. I love it to work in a team of grown ups, all trying to get the best result, to make the most perfect pictures. Perfect as in the closest to the original ideas of the client or the photographer. Everyone has his own specialty and does his utmost and all together you work for and hope for pictures that are magic, pictures that people look at more than once because they are special. PR: Under what criteria did you choose your mother agency?CHARLOTTE: For me it’s really important to feel appreciated and understood by the people of my agency. I think you can only have a good and solid relationship when there is trust, understanding and having the same goals. It’s important when Max Models (my agency) knows what my dreams and ultimate goals are and of course the other way around, it’s important that I know what they think is good for me, and which road they see for me. Communication is the key-word here in my opinion, every now and than sitting around a table, looking at “where are we now, where do we wanna go to and how do we wanna get there”. I signed up with Max Models because the minute I got in there I felt at ease, appreciated and besides that it all looked very professional and I know they have a lot of experience in working with starting models as well as with top models. PR: How does a developing process of a model work? CHARLOTTE: Since I’ve joined Max I have done a few tests and my boss (Gertjan Holleman) recently gave me some tips for other stretch-exercising. Somewhere around February we’ve planned another get together to talk about the future, see if I really wanna work international and see if they still think I can work in other countries. I was never told to loose weight or cut my hair by the way. PR: Did you learn about the modeling business yourself, or did you have a lot of guidance from your mother agency?CHARLOTTE: I’m sure that whenever I need more guidance I will get it from Max. But I have learned a lot just by doing the job. With every shoot or show you work with different people, under different conditions, different wishes. I always try to learn from the people around me, they are the ones with experience, they know what they want and why they want it that way. And of course I pick up some things every now and then from other models. I think when you’re new you always must try to have an open eye/ear for advice and after that decide if you gonna follow that advice or maybe not. Just using common sense and an open mind will teach you a lot in my opinion. PR: Did anyone tell you during castings or fittings to change something about yourself?CHARLOTTE: Once I have been told to cut my hair, the hair artist thought the length of my hair was to long and the length made it very difficult to work with. It was during the preparation of a test, the photographer didn’t agree with her and when I asked my agency later they also told me that my hair was just fine. A few times my hair was cut before a shoot but that was only a few inches. PR: How do you pose? CHARLOTTE: I personally like to pose in motion, slow motion. For me, moving is all about getting into whatever the photographer wants me to be, getting into the spirit of the character he wants me to be. Moving that way helps me to get the right feeling and the right expressions. But of course the photographer is the one who comes first, most important are his or her wishes. If he doesn’t want me to move a lot I won’t. PR: What do you personally think, are you more commercial, more editorial, catwalk, etc...?CHARLOTTE: I don’t know yet, more than once I have been told that my face is as well beautiful as it is a little weird, edgy. I only hope that it’s not a problem of being not enough commercial as well as not enough weird, to much of being in between. I would love doing more editorial. PR: What do you think, what is your X factor? 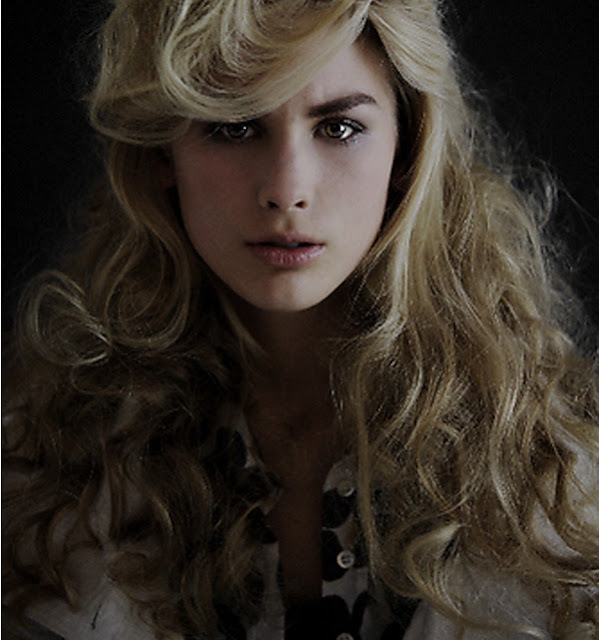 What distinguishes You from other models?CHARLOTTE: I think my hair and my eyes, I can show a lot through my eyes. PR: What is the best beauty advice you know of?CHARLOTTE: Pick a sport you like and drink a lot of water and tea. PR: What make-up do you always wear?CHARLOTTE: I don’t wear that much make up, I use lip gloss of Biotherm and Lancome Amplicils mascara. Oh and I love the nail polish Blue Satin from Chanel. PR: Your hair seems great. Does it require special attention or it is just like that on its own. What hair product do You use?CHARLOTTE: My hair is like it is and doesn’t require much special attention. Since I do sport every day I wash it at least once a day. I use whatever the shampoo and conditioner my mother has bought. Oh well, not entirely true, in the summer I sometimes use a shampoo for blonds. But that is pretty much it. And of course during the summer I often wear a hat because of the sun, also to protect my skin. PR: How do you stay in shape?CHARLOTTE: I sport every day, at least once a day. Not because I have to, but really because I like to. I play field hockey several times a week, just having fun with girlfriends but we’re very fanatic at the same time. Have to be because we play in the first team of my city. Besides that I visit the gym several times a week and I like to run. PR: Do models eat?CHARLOTTE: I don’t know about others but I eat. However I always try to eat healthy and when I snack I always do that with vegetables and fruit. Fortunately I don’t care that much for sweet so that’s something I never eat. Every day I eat a lot of vegetables (cucumbers, tomatoes) and a lot of fruit. PR: What is your favorite food? CHARLOTTE: My favorite food is sushi or a huge Ceasar salad or grilled salmon with carrots. PR: What is your personal style?CHARLOTTE: You mean in clothing? PR: Yes.CHARLOTTE: I really feel comfortable in skinny jeans with a tee and a jacket, wearing boots or very high heels(never something in between). PR: Do you already have a first modeling assignment?CHARLOTTE: I have had an editorial of 6 pages in magazine Celebrity, a picture in Avant Gard, a picture with small interview in The Blend, a publication in Elle and there’s an editorial of 8 pages in Yes with maybe the cover. I have done several shows at the Amsterdam Fashion Week. I hope it’s just the beginning of a lot more assignments.